When we travel we love spending time checking out the local street art. In some cities, it almost jumps off the walls at you and in other places you need to do some hunting but wherever you go the subjects featured can tell you a lot about the culture and politics of the place. 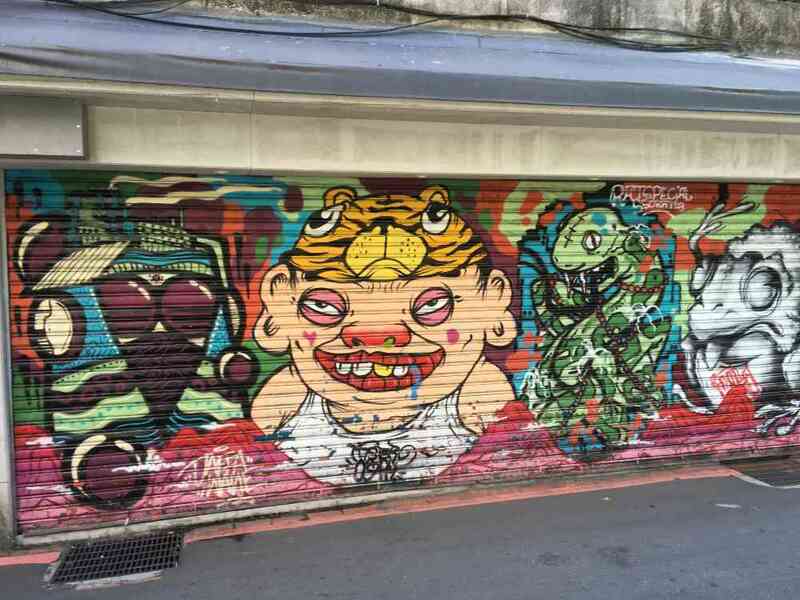 We recently got to talking with blogger friends about which Asian cities are the best hot spots for street art and murals. 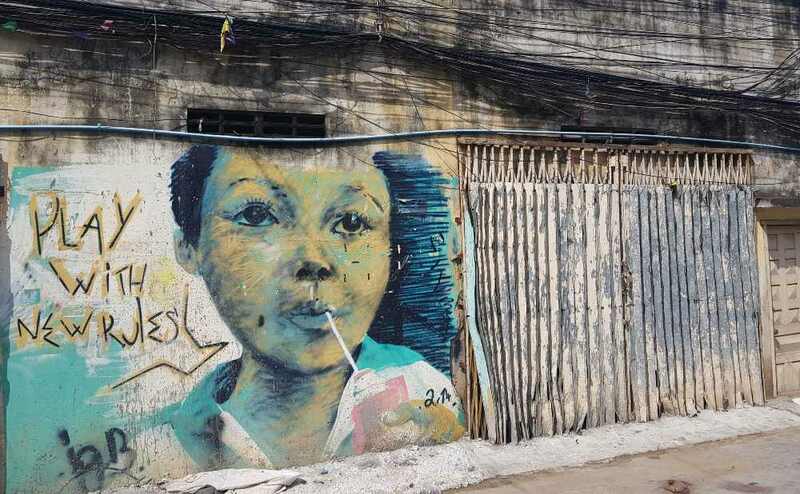 One thing lead to another and we have pulled all their favourite examples of street art in Asia into one post. 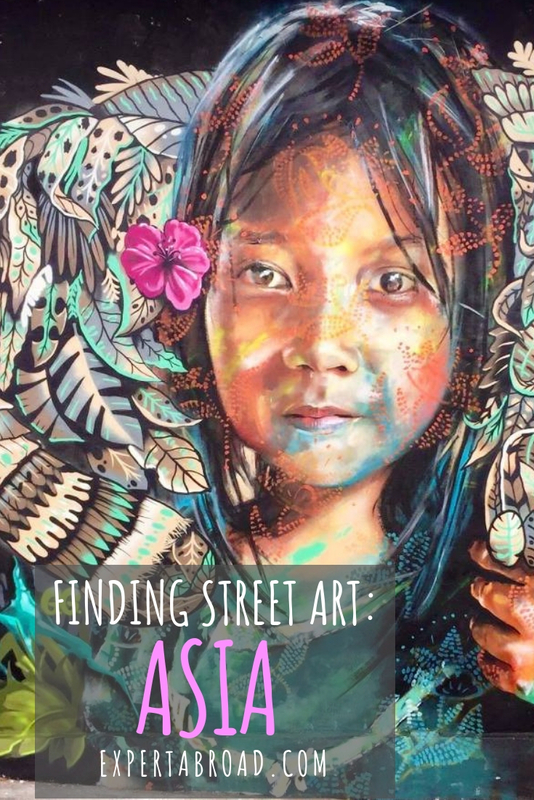 So in alphabetical order, because we could not decide what we like best, we present the street art of Asia according to some of our favourite travel bloggers. Last year we spent one month in Cambodia visiting several cities and we were surprised to find work by both local and international artists in 3 of the cities we visited. These two towns are just a 30 min drive apart and we spent a few nights in each. We really enjoyed the relaxed vibe in Kampot and the architecture and natural beauty in Kep. 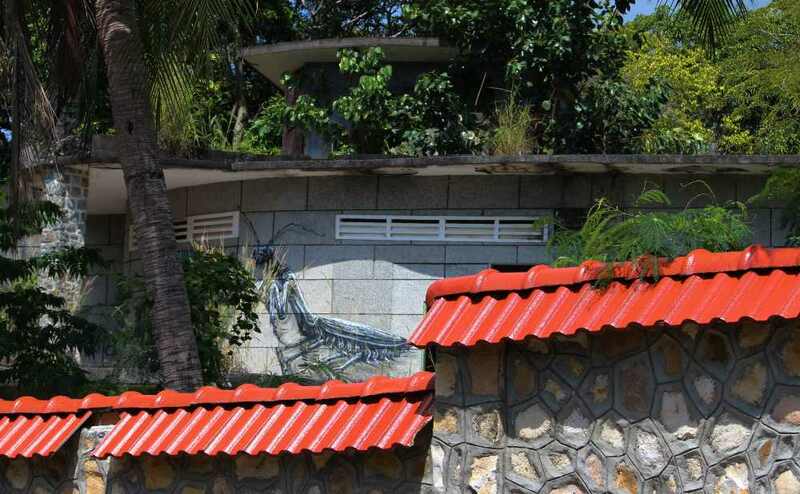 This insect by Belgian artist ROA was on the wall of one of the abandoned villas . There are abandoned buildings throughout this area. These once beautiful French Colonial houses were seized by the Khmer Rouge in the 1950s and have laid empty ever since. Locals told us that they are slowly being bought by wealthy investors from the capital to be restored as holiday homes or hotels. Foreign buyers are also showing interest. It will be fantastic to see them restored to their former glory but until then they provide perfect canvases for artists. 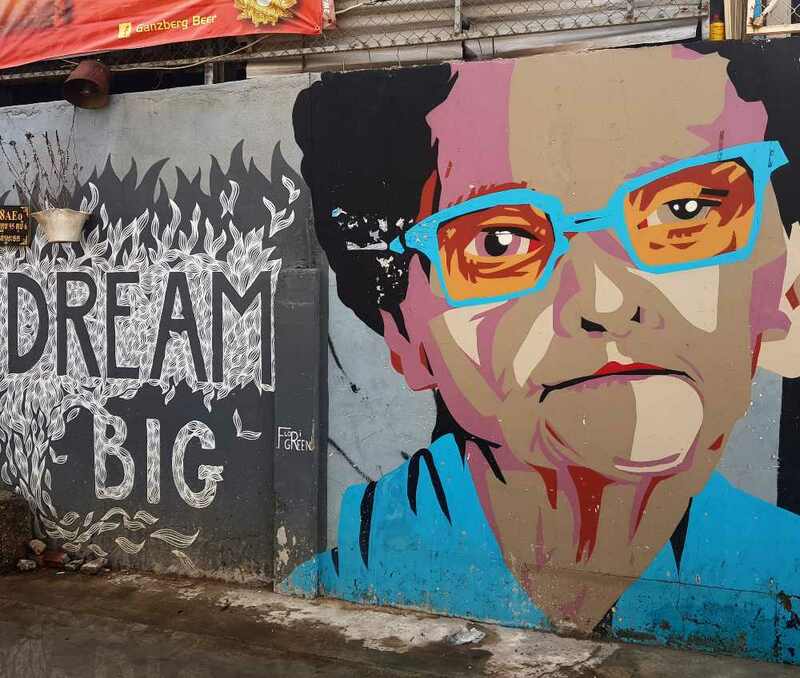 We spent 4 nights in Phnom Penh and dedicated one morning touring the city with a local guide on the hunt for hidden street art. The main concentration is in a reclaimed area known as Lakeside or Beoung Kak. Lakeside is under significant development so these works come and go. The scene here is fairly new and with the development taking place across the city it can be rather fleeting. We found a mix of floaty characters and subtle policial pieces. While the government are quick to paint over anything controversial there is now an annual street art festival held in December that has seen more work appear of the last three years. There is also quite a bit of commissioned work appearing inside coffee shops and cafes. 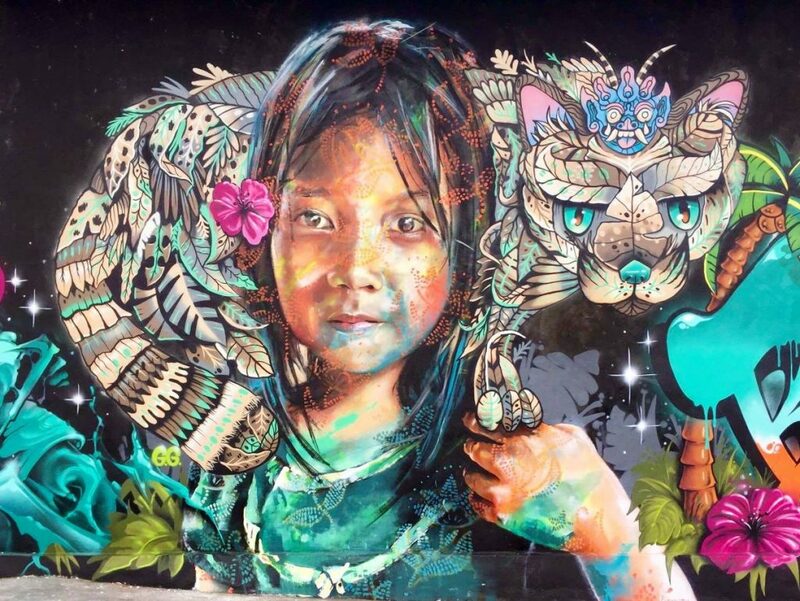 Sandy from Tray Tables Away shares one of her favourite murals from Canggu in Bali. This stunning mural was part of a collaboration between 4 well known international artists for the 2017 Tropica Street Art Festival, including ‘Gus’ from Brisbane, Australia. The festival is held annually and showcases the work of around 50 international and Indonesian artists. Held at Tropica Urban Park on JL Raya Canggu the festival includes painting, music and parties. 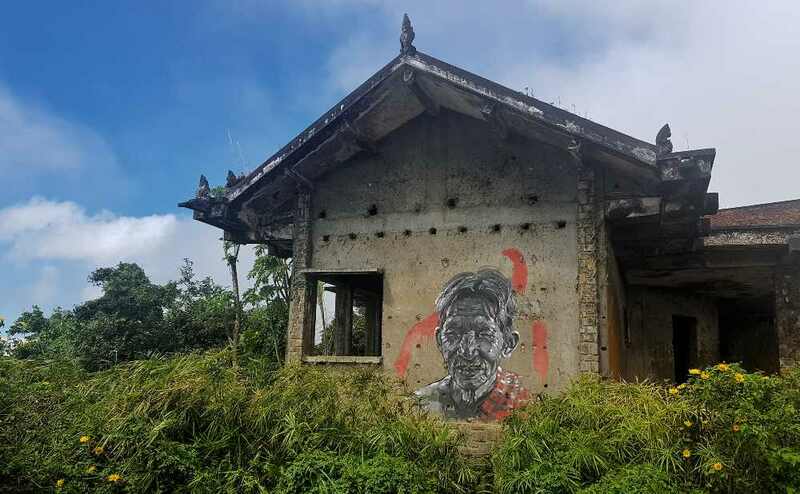 This mural is called “Guardian of Bali” and was inspired by the Luwak – the poor Civet animals who are caged to harvest the coffee beans they digest. It’s over 50 meters long as well! I’ve chosen this piece as it is not only very beautiful but it also raised awareness for a very good cause. Jo Castro from Lifestyle Fifty shares her love of the art in Ubud. I first visited Ubud in Bali in 1983 when the streets were quiet and empty of cars, well before the tourism wave had spread beyond Kuta. I met artist Antonio Blanco who took three of us backpacking ingenues around his studio, preaching philosophy and religion and big ideas which totally slayed us when actually we could, at that age, barely see further than the next Bintang Beer! Malaysia in my opinion is the street art capital of Asia. We have spent many weeks exploring the country and always been impressed by the quality of the work here. 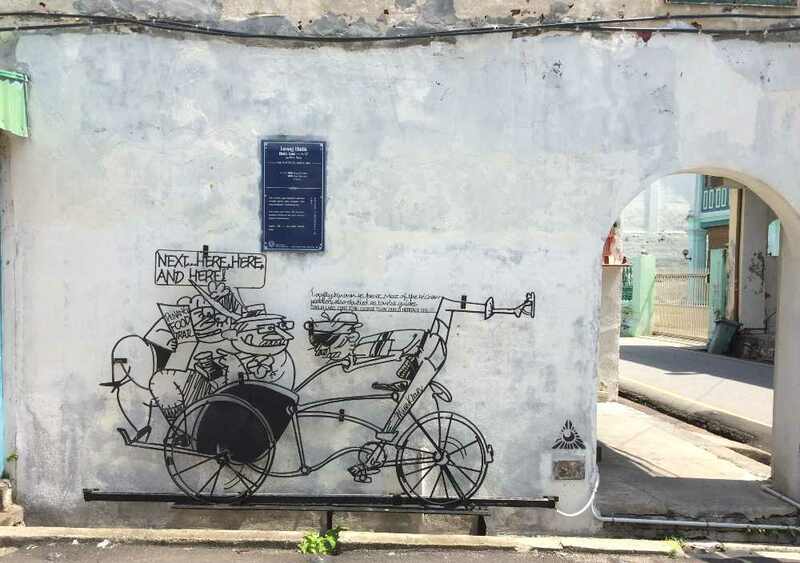 Helen from Destination Differentville shares here experience of checking out the street art in Ipoh. 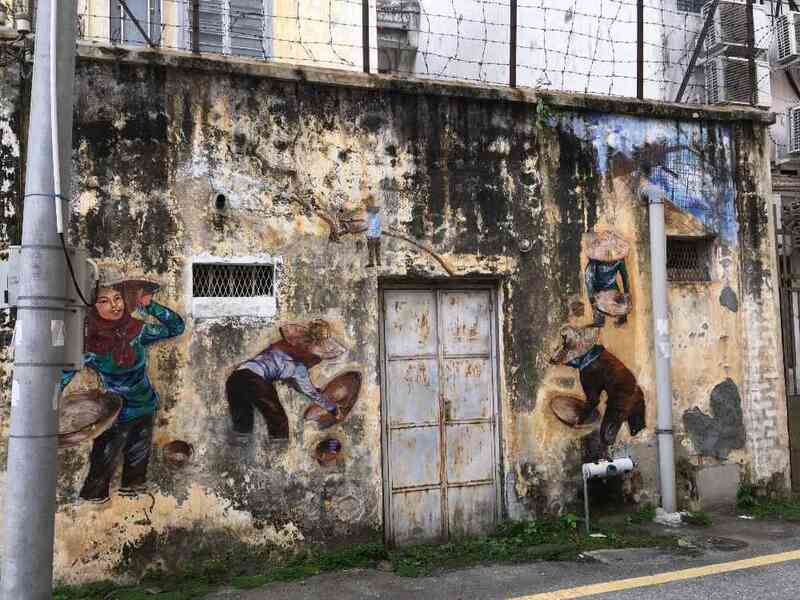 If Penang is the king of Street Art in Malaysia, Ipoh is the Prince Regent, smaller, on fewer tourist radars, but packed with amazing art including works by Ernest Zacharevic – the Lithuanian artist famous for creating interactive works you can pose within. Google maps is your friend in Ipoh – most of the big works are actively marked. Outside of the old town, walk east about 10 minutes to Mural Arts Lane The art here might not be as big as that in old town but the chipped plaster, mould and plants growing into these murals give them that extra something. Top tip – stay the night in Ipoh if you possibly can (or at least get a late train back to Kuala Lumpur). A lot of the works are in car parks and blocked by cars and giant tour buses in the middle of the day. Things start to calm down about 4pm though and by 6pm you can get to everything with ease. We stayed at the Ban Loong Hotel which is a bargain and in a fantastic location for just nipping out to get that last shot. Marie Moncrieff from Life Without Borders shares her favourite work in Ipoh. The words Malaysia and street art together evoke images of Penang’s vibrant street art scene. 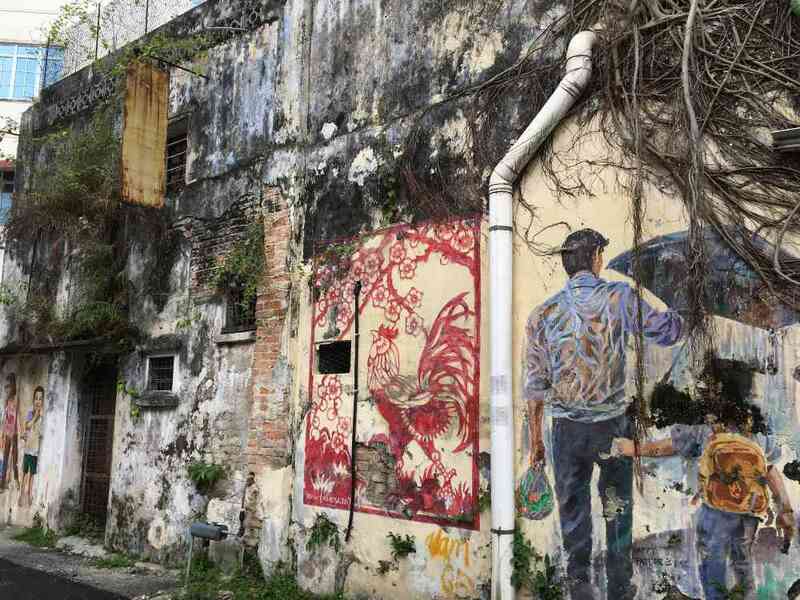 However the lesser-known town of Ipoh has an equally impressive array of street art – but without the crowds! 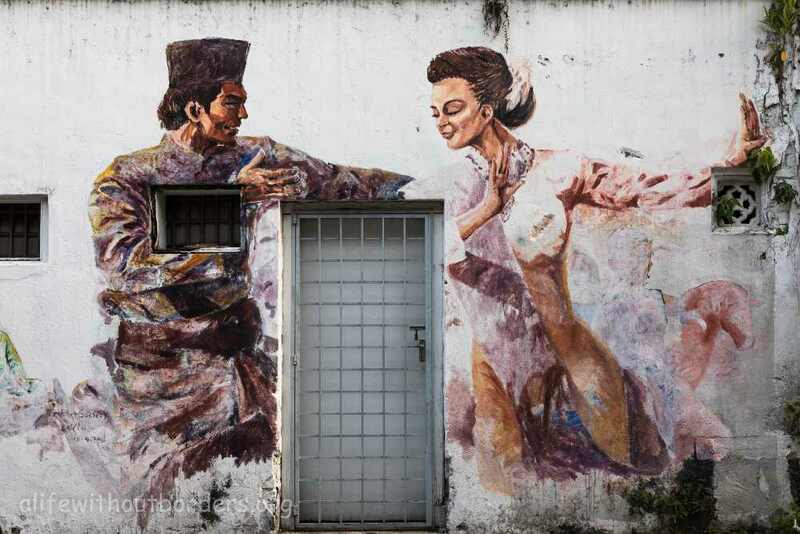 Ipoh, capital of the Perak region, is situated half-way between Kuala Lumpur and George Town, Penang and is an up-and-coming street art destination. My favourite art work in Ipoh is the Malaysian Joget Dancers by Eric Lai. Lai, a local art teacher from the Ipoh suburb of Bercham, creates murals highlighting the diverse cultural history of Malaysia. I love that he often gives back to the community by undertaking these art works alongside youth in the area. Eric Lai’s portrayal of the Joget Dancers depicts the intimacy, grace and playfulness between the dancing partners. Additionally, I enjoy Lai incorporating into his works existing natural and built elements such as moss, cracks, windows and doors. This art work sits amongst a series of wall art conveniently located in the one laneway. 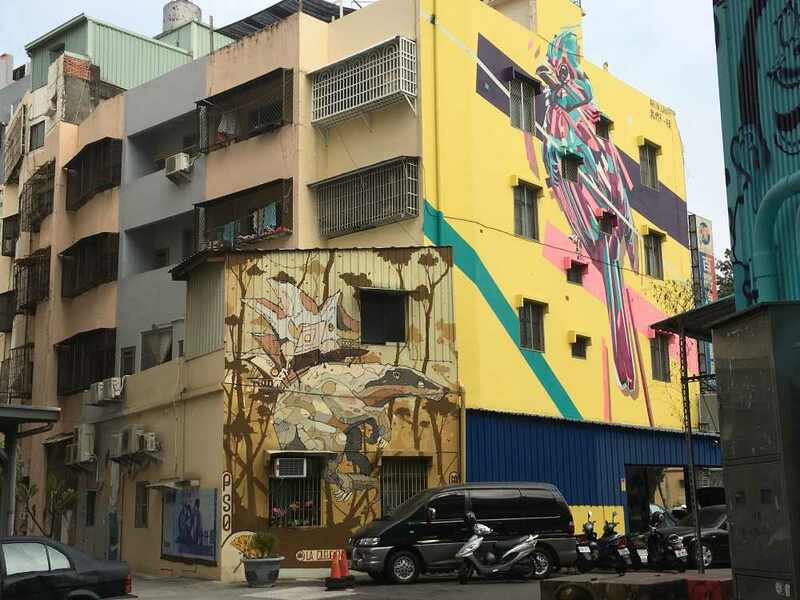 Known as Mural Arts Lane, it can be found between Jalan Masjid and Jalan Sultan Iskander in Ipoh New Town. 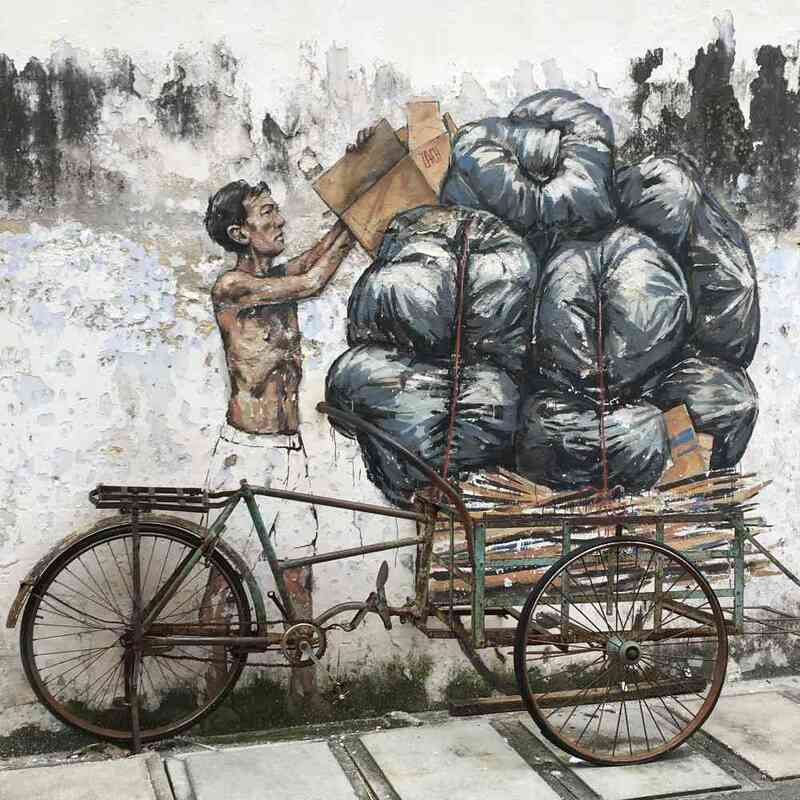 Sharon from Dive into Malaysia shared one of her favourite murals by Ernest Zacharevic. 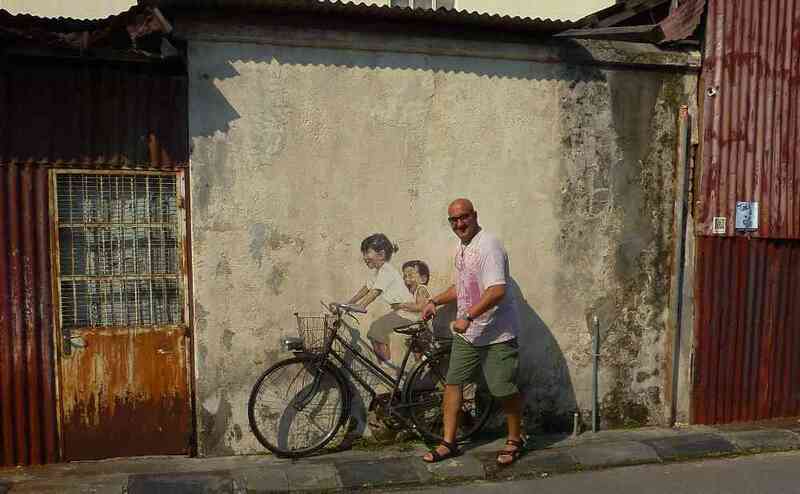 Ipoh is a fabulous place to visit if you are interested in street art in South East Asia. There are murals scattered around the Old Town. You can pick up a map to find these from the visitor centre or you are likely to find many yourself just by wandering around. It started with seven murals but now there are many more. What I love about the street murals here is that they are in places so that the pictures fit into the location. So this photo shows a paper airplane and it’s high on a building. There are ones that show street sellers on the side of buildings in alley ways. It’s clever and it adds to the atmosphere of a fun city. The artist responsible for this cool work is Ernest Zacharevic, a Lithuanian. 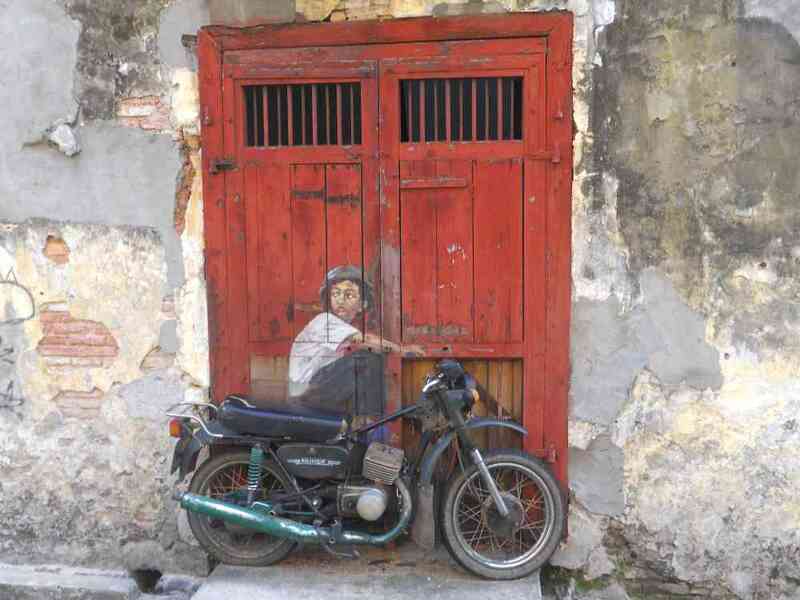 He also completed the street art in Penang and other locations in Malaysia and Singapore. Bron from Smiths on the Road shares one of her favourites from Kuching in Sarawak Malaysia. Kuching is the perfect little town to explore by foot and get lost amongst the temples and buildings to find hidden street art. Aside from seeing Orangutans, exploring river life and learning about Sarawak culture they have some cool street art pieces to find! Across from the riverfront, there is a small street dotted with cafes serving local delights. I love the street art that depicts the cultural melting pot here in Malaysia along with the traditional ethnic groups here in Kuching, Borneo. The is the second #tanahairku Street Art project work, on Lebuh Wayang across from the Chinese Temple. Penang has more street art per capita than anywhere I have visited. 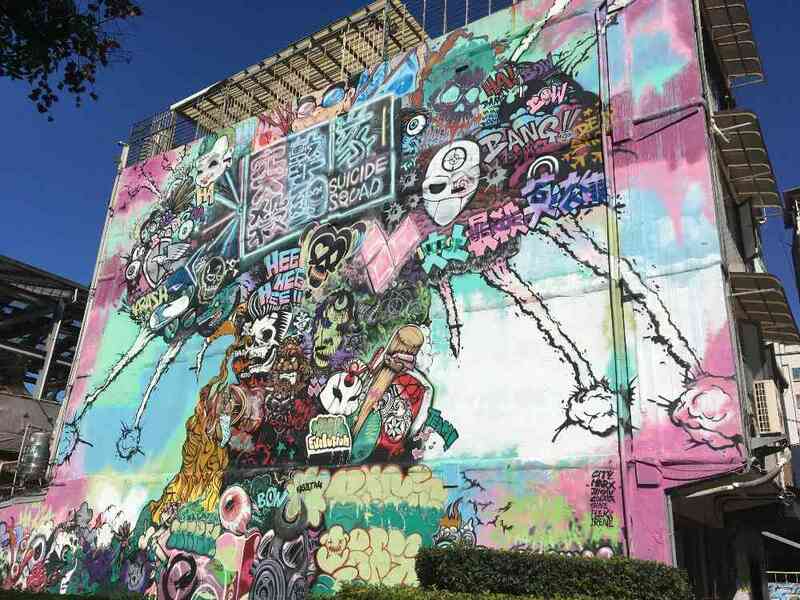 Sarah Carter, ASocialNomad shares some insight on the city’s street art scene. Penang is the queen of SE Asian street art, perhaps because she has so much, but that’s because Penang decided to make it so. 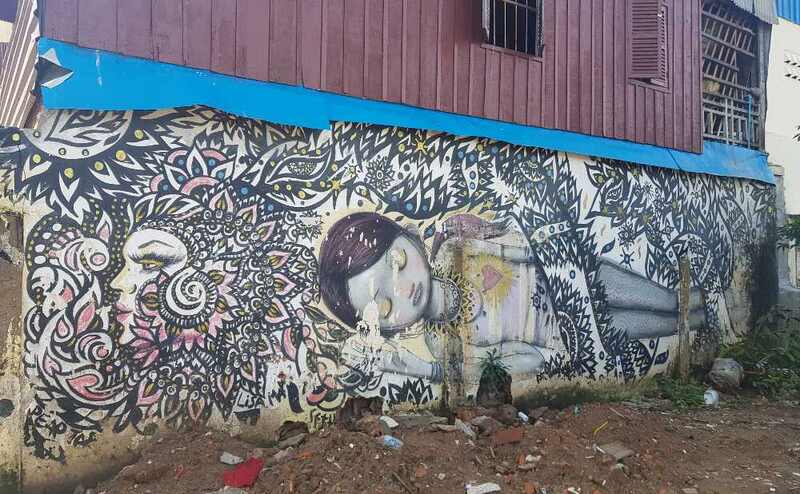 The street art that you’ll find here is a true celebration of the multi-cultural aspects of the city and also gives a great insight into her history. UNESCO has recognized George Town since 2007 along with Melaka. 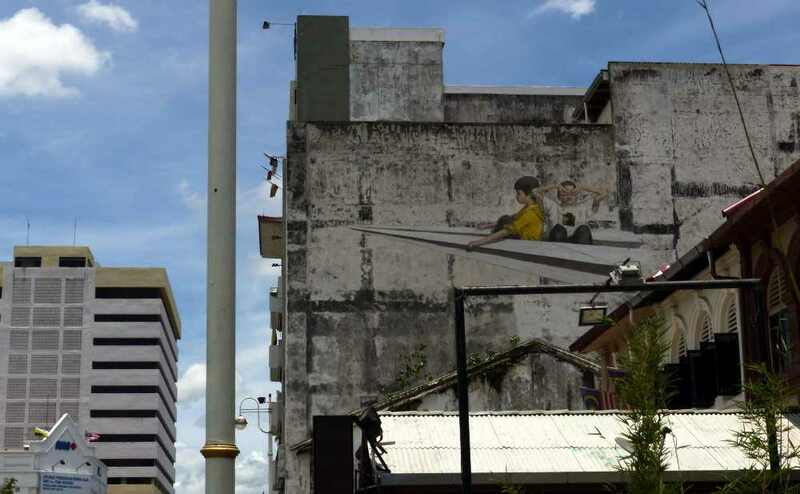 There are many, many art installations in George Town but they started in 2012 with the works of Ernest Zacharevic who was commissioned to paint a few murals in 2012 – and other artists have since contributed. These pieces of art combine paint and materials to create an interactive approach that is extremely popular and good fun to see. The installations are spread throughout George Town, but the city provides a map and a walking route to see the major installations. It’s a great way to see the city and explore the streets and the artwork is both stunning and humorous too! 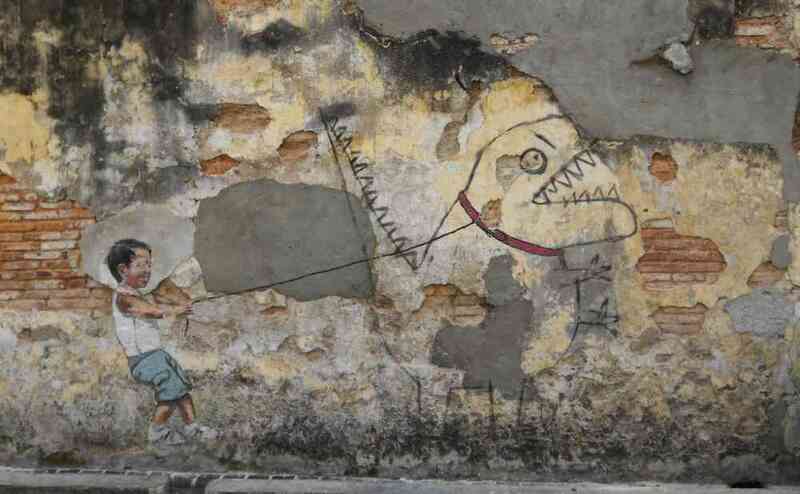 Learn more about these fascinating installations in Penang. from Penang Insider. Read more of Sarah’s work on her website ASocialNomad. 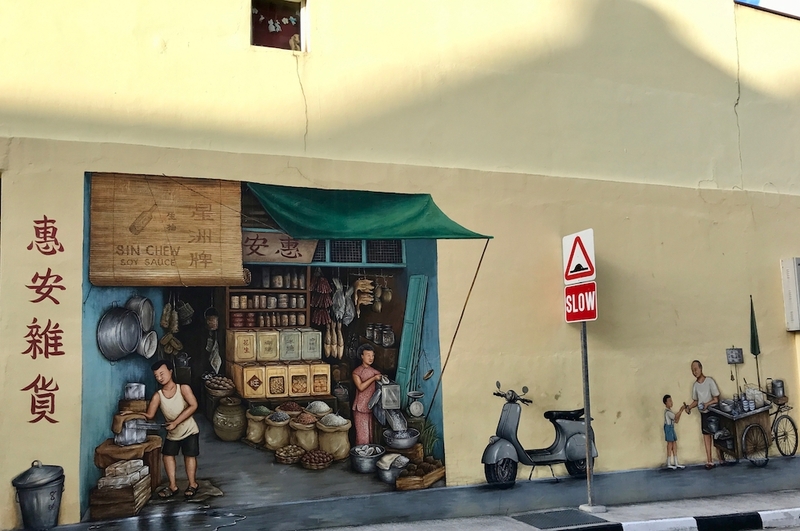 Susan Davies from Travel for Life Now shares a mural from Singapore. Singapore is probably the last place that you would expect to find street art. Its reputation for order and cleanliness is known throughout the world. Over the last few years, however, as street art has grown through the world, a street art and mural community has grown in Singapore. The street art in Singapore began after 2010 and became much larger during Singapore’s 50 anniversary in 2015 when the government requested some of the murals. 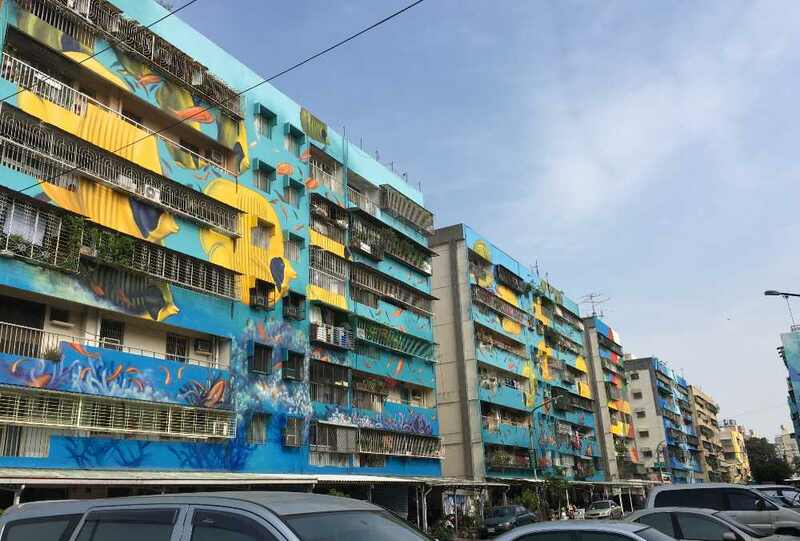 This is still Singapore so artists and owners need to apply for permission to paint murals in the walls of homes and businesses. And, you won’t find any graffiti which is still punishable by canning. What you will find are beautiful murals. Some are very nostalgic and others more free form. 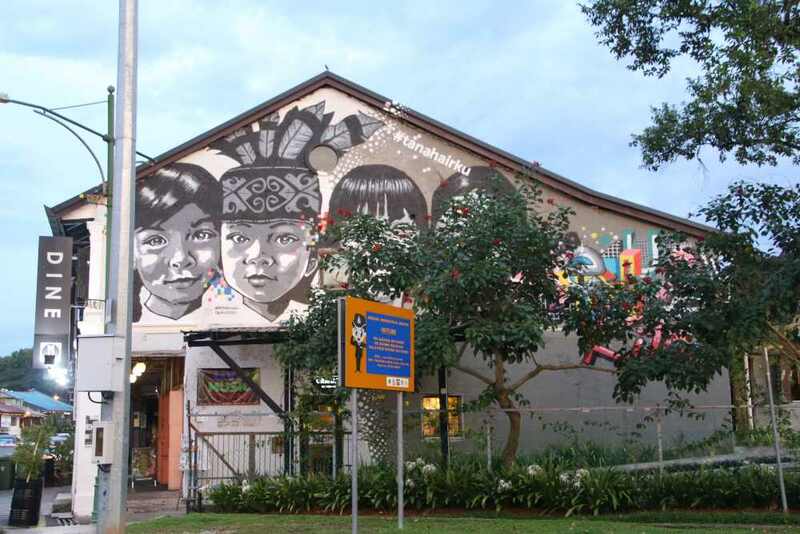 Murals can be found in Chinatown, Little India, Kampong Bahru, Tanjong Pagar Tiong Bahru and other areas of the city. 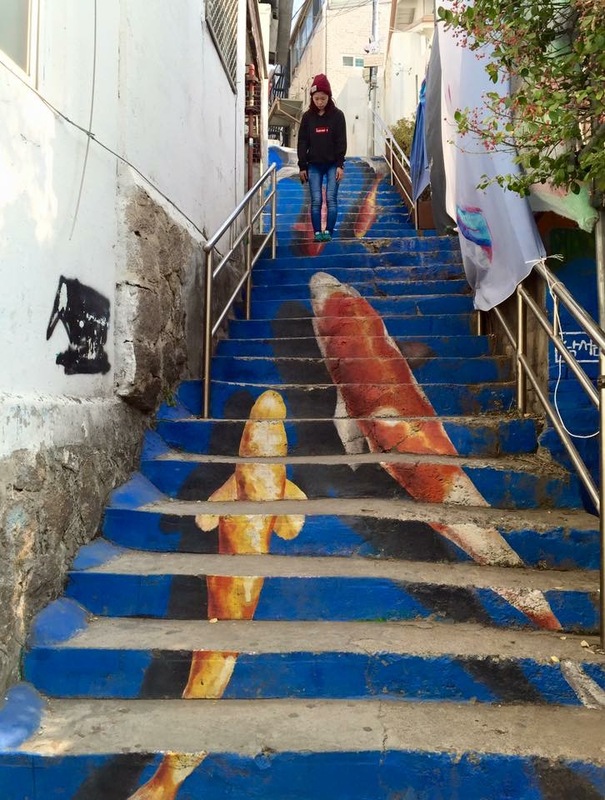 Check out more of Susan’s posts about street art she has discovered on her website. Sandra Muller from the Smarter Writer came across this interesting work in Seoul. Cheonggycheon Stream is a stream that runs for many kilometres through downtown Seoul. It was part of an urban renewal program that saw this stream, previously hidden by an elevated highway, returned to its natural state (or near enough to!) It’s lovely to wander along next to the stream, taking in the many public artworks along the narrow pathways. You feel miles away from the traffic above and in summertime, it’s much cooler by the stream than it is above near the buildings and traffic. 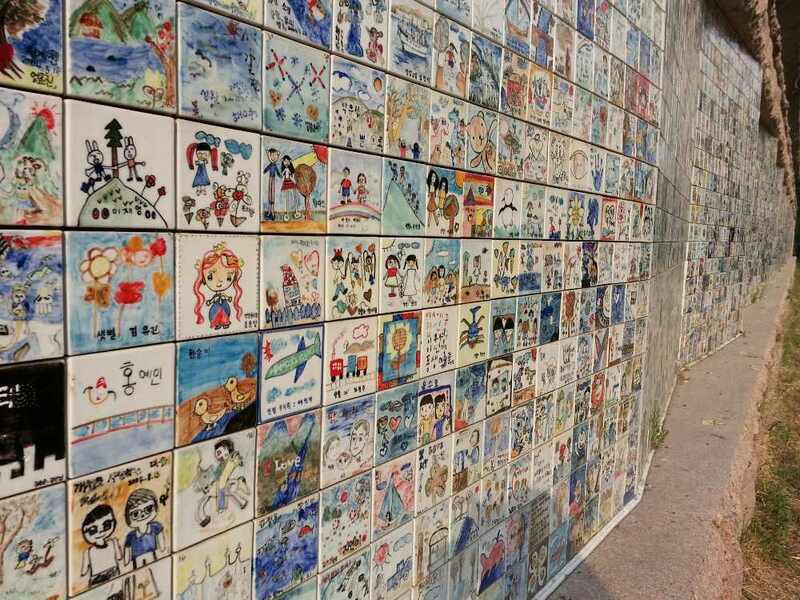 One of my favourite artworks was this 50-metre-wide wall made with tiles decorated by Korean kids. Called ‘The wall of Hope”, it depicts the kids’ dreams and aspirations for a hopeful future where South Koreans, North Koreans, and overseas Koreans experience national unity and reunification. There are 20,000 10 cm x 10 cm tiles making up this 2.2-metre-high wall. It was a lovely walk and and lovely way to take in some of Seoul’s street art. You can follow Sandra on Facebook for more of her work. 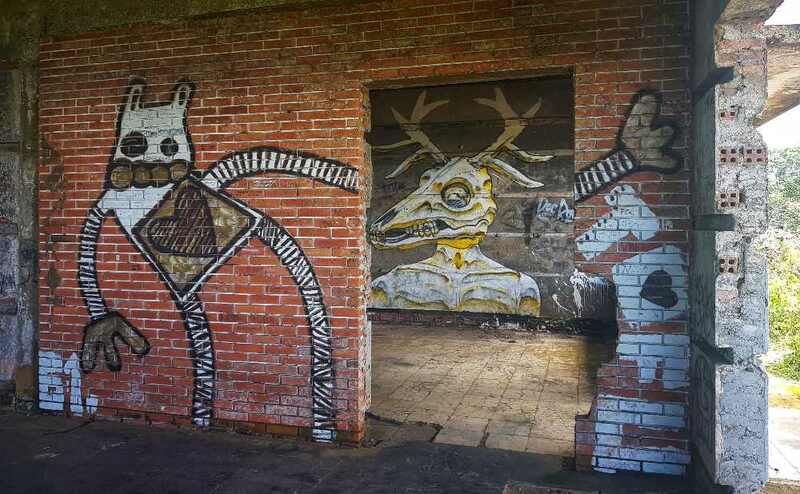 Yuyu from Type Eighty shares a mural village just outside Seoul city. 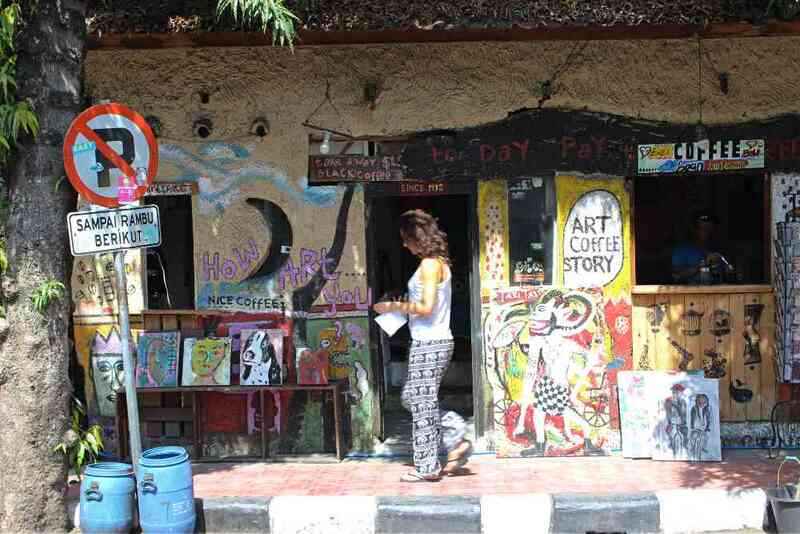 Ihwa Mural Village used to be an underdeveloped slum before it’s revitalized with paintings and art installations back in 2006, transforming it to a popular destination for both local and foreign tourists. I always love street arts and this quiet neighbourhood is a hidden gem with more than 100 art installations. Keep in mind that you won’t be able to find the famous murals in the village, flower staircase and fish staircase, anymore. Sadly, these two murals were removed in 2016 by some disgruntled local residents by painting it over with grey paint. To get to the village, you only need to follow the sign to Naksan park which will lead you the village located at the top. The climb in this village is pretty steep and long. I don’t recommend you to visit this place if you’re travelling with elderly or those with a mobility issue. As you reached the top, you’ll get to enjoy the amazing panoramic view of the houses and the surrounding city of Seoul. There’re a few cafes with nice balcony along the way, making it a perfect spot to relax, eat and drink. See more of their work on their website. 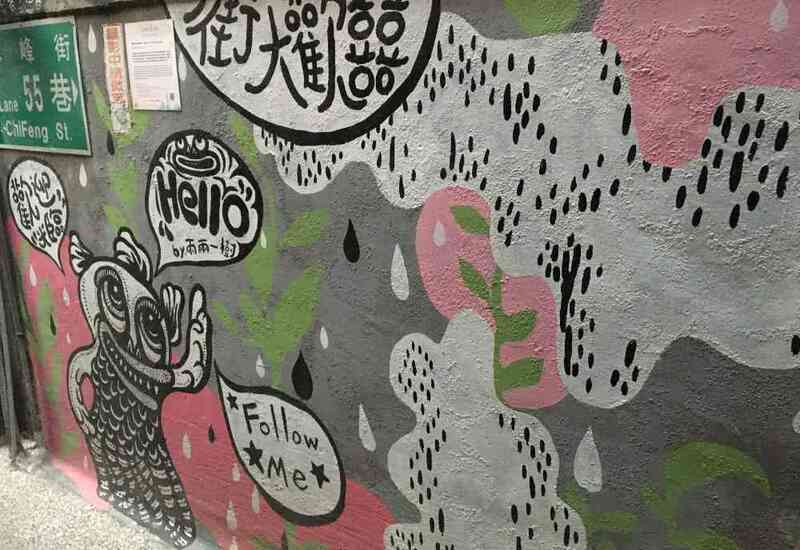 Helen from Destination Differentville is our Taiwan expert and shares some insight into the street art you will find here. Warning. Warning. If you like street art, the southern Taiwanese city of Kaohsiung is going to run out your phone battery. Let’s start with the mind-blowing Lingya district, a residential district close to Weiwuying station (exit 5, turn right up Jianjun Road). It’s a riot of colour with huge murals swathing the apartment buildings for about four square blocks. If you get tired of looking up at the enormous swirling koi-carp or huge deer, smaller murals dot garages and electrical boxes and the odd bright sculpture pops up on the pavement to keep you on your toes. Next up, head for some history alongside your art fix – the Former Japanese Navy Communication Centre in Fongshan has a chequered past as a discipline camp for soldiers who’d gone off the rails, but while the buildings inside share a sad history, the walls that surround the site are filled with bright, uplifting paintings. Lastly, you can’t visit Kaohsiung without taking a trip to the Pier 2 Art District. Well you can, but that would be silly as it’s a feast of murals, sculptures and quirky photogenic touches like a display of stacked up chairs that even had me taking selfies! They call the Ximen district in Taipei the city’s Harajuku, after the super cool area in Tokyo – but what Ximen has that Harajuku doesn’t is street art – lots of it. Focused mostly in the alleys and open spaces around the Taipei Cinema Park, you’ll come across international artists like Alex Face juxtaposed next to local talent like Mister Ogay whose favourite motif seems to be a man who looks a bit like a potato in a vest. But while the art in Ximen is amazing, don’t miss out on the smaller works collected around Chifeng Street in Zhongshan. It’s is a strange area, a mix of hipster cafes and working motorbike repair shops that scent the area with a faint whiff of grease – and searching out the street art literally means wandering down alleys and hoping you strike gold. A good starting place is the area around Hudson Coffee, about halfway up the road, but that’s as much as I’m going to tell you. Poking your nose down the alleys really is part of the fun. You can read about fun strange and unusual things to see in Taiwan on Helen’s website. Have you come across any great street art in Asia? We would love to hear about it so please leave us a comment. Have a question about something here? Want advice for planning your own visit? Head to our Facebook page and we will do our best to help.